Nov. 13, 2018 — While two key Senate races in Florida and Arizona as well as the Georgia governor’s campaign remain languishing in a situation rife with uncounted votes and complaints about election officials, progress is being made with outstanding House races. Two of the nine congressional races were called over the weekend, one for each party. Looking at the trends in the remaining seven, it appears the Democrats’ final conversion number may now approach 40. In California, 15-term Rep. Rohrabacher (R-Costa Mesa) has gone down to defeat at the hands of businessman Harley Rouda (D). Though thousands of votes remain to be counted, a projection has been made in Rouda’s favor. Three more California races still remain uncalled, however, and a final result could still consume days if not weeks. 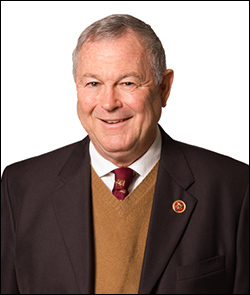 Rep. Rohrabacher fell into trouble in what should be a strong Republican district with stories about how the congressman was making favorable statements toward Russian president Vladimir Putin and being close to some Russian officials. The FBI warned Rohrabacher that the Kremlin had even assigned him a code name. Republicans, concerned about his actions, curtailed his role as chairman of the House Foreign Affairs subcommittee on Europe, Eurasia, and Emerging Threats. Rohrabacher signaled his political trouble when he scored only 30.3 percent of the vote in the state’s jungle primary, even though he finished first in a pool of 16 candidates. Rouda, placing second by just 125 votes, which allowed him to advance into the general election, was able to overwhelm the congressman in campaign funding. The Democrat’s campaign spent over $7 million, including $2 million from his personal finances, as compared to about $2.5 million for Rohrabacher. Turning to North Carolina, Baptist former pastor Mark Harris (R) has successfully held the open 9th District Republican seat, as he defeated businessman Dan McCready (D). Harris has been projected to win with an approximately 2,000-vote margin (49.4 – 48.8 percent), and overcame a better than 1:2 ratio in campaign spending. It appears McCready will spend close to, or over, $5 million in his losing effort as compared to Harris spending in the $2 million range. In the Republican primary, Harris unseated three-term Rep. Bob Pittenger (R-Charlotte), but he managed to hold what became a competitive seat in the general election. The 9th District begins in the Charlotte metropolitan area and then stretches along the South Carolina border all the way to the Fayetteville suburbs. McCready, a business owner, was one of the Democratic candidates saying he would not support Nancy Pelosi for Speaker, even going so far as to making the statement in his campaign ads. All of these races have a greater number of outstanding and uncounted ballots than the current margins, and thus each could still turnaround. NOTE: In the Maine district, it appears that Rep. Poliquin will likely finish ahead of Golden but will not attain majority support. In previous years, this would have elected Poliquin, as it would in almost every other state, but Maine’s new ranked voting instant run-off system will likely flip the result to Golden. Therefore, we can expect continued counting and much legal wrangling to occur until this final result is recorded.